Tendons are a type of connective tissue that connect bone to muscle. Tendonitis occurs when the tendon is inflamed or damaged. Tendonitis may be acute or chronic. Acute tendonitis often occurs after performing certain actions, such as throwing a ball or lifting things above the head. In contrast, chronic tendonitis results from gradual degeneration of the tendon tissue. The rotator cuff tendons, which stabilize the ball of the humerus (upper arm bone) in the shoulder joint, are most often affected by tendonitis. Fractures are most often the result of an acute injury. This might include falling, playing contact sports or getting into a motor vehicle accident. Shoulder pain may result if the humerus, scapula (shoulder blade) or clavicle (collarbone) become fractured. Fractures may range in their severity. Typically, they are characterized by severe shoulder pain, bruised skin and inflammation. Osteoarthritis is a common condition during aging, with many people beginning to experience shoulder pain in middle age. Osteoarthritis is the consequence of wear and tear on the shoulder joint. Typically, arthritis does not cause sharp or stabbing pain. Instead, symptoms may include aching, stiffness and swelling. Shoulder instability is a situation in which the humerus comes out of the shoulder socket. If the ball of the humerus comes partially out of the socket, it is known as a shoulder subluxation. When the ball completely comes out of the socket, orthopedic specialists refer to it as a complete dislocation. 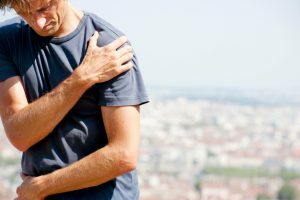 Shoulder instability can loosen the tendons, ligaments and muscles holding the shoulder joint in place. Shoulder impingement is a condition in which the anatomy of the shoulder causes soft tissue to be damaged. In this condition, lifting the arm away from the body causes the top of the shoulder blade to put excess pressure onto the bursa and rotator cuff tendons. Over time, this rubbing motion causes the tendon or bursa to become damaged. Southeast Orthopedic Specialists can help you choose the treatment that is best for you.